The Patriot LX Class 10 SDHC memory card offers blazingly fast performance to capture your images or video as they happen without missing a moment. 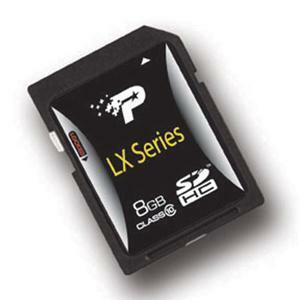 The LX Class 10 SDHC memory cards are fully compatible with the latest SD Association specifications calling for a minimum sustained write speed of 10MB/s and offer an incredible performance improvement over earlier SDHC standards. Fast enough to record High Definition 1920 x 1080 resolution video, our LX Class 10 SDHC cards keep up with the most demanding new photography and video equipment making them perfect for a new DSLR user or the seasoned professional. Capture every image or video without missing a moment. Depend on the Patriot XL Class 10 SDHC card.